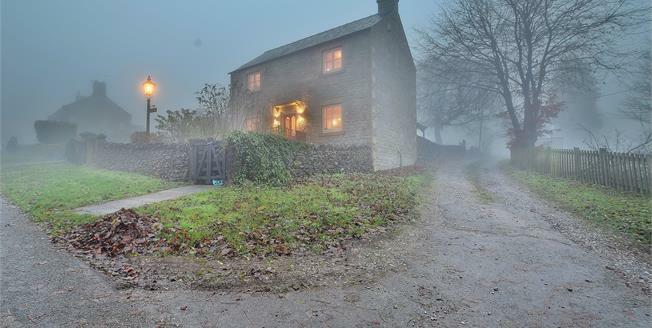 Drystones represents an excellent opportunity for local buyers to acquire a recently constructed detached property set in very generous grounds in this sought after Peak District village. A ground floor entrance lobby opens to the roomy dining kitchen, a superb living room complete with an oil fired stove and double doors out to the rear patio and a rear utility/porch, whilst to the the first floor the spacious landing opens to the master bedroom with dual aspect windows, a second double bedroom and the bathroom. Other features include underfloor heating throughout, timber-framed double glazed windows and spacious gardens, especially at the rear, where the main garden doglegs into an adjacent and included stretch of land, whilst a parking bay set behind substantial double gates allows for ample off-road parking. Viewing is highly recommended, although we would request that in the first instance you ensure that you qualify under the section 106 local occupancy clause before making a viewing request to avoid any unnecessary disappointment. Double glazed entrance door, tiled flooring with underfloor heating and a glazed door to the kitchen diner. Comprising wall and base units, roll top work surfaces including an inset stainless steel sink, an integrated electric oven, an integrated electric hob with over hob extractor, space for a dishwasher and space for a fridge. Double glazed windows facing the front and rear, underfloor heating, tiled flooring and downlights. Double glazed double doors opening onto the rear patio, a double glazed window facing the front, underfloor heating and an oil fired stove and wall lights. Double glazed door to rear opening on to the rear patio, underfloor heating, tiled flooring, a roll top work surface and space for a washing machine and a dryer. Spindled balustrade, a storage cupboard and a double glazed window to the rear. Double glazed windows facing the front and rear and underfloor heating. Double glazed window facing the front and underfloor heating. Comprising a panelled bath with mixer tap and shower over, a vanity unit with wash hand basin and a concealed cistern WC. Double glazed window facing the rear, underfloor heating, tiled flooring, an extractor fan and a shaving point.